Worldwide there are 285 million people with visual impairments of which 39 million people are blind and 246 million visually impaired. A stunning 90% of people with visual disabilities live in developing countries. In developing countries, blindness leads to major economic and social problems. Blind people can no longer work normally and are dependent on family members and friends. Eighty percent of blindness is avoidable or can be easily cured with, for example, cataract surgery or a good pair of glasses. The available treatments for the prevention and cure of blindness are the most effective and cheapest of all measures in the field of healthcare. The Eye Care Foundation strives for a world where good eye care is accessible to everyone so that they can have the opportunity to build a future with clear vision. But it is impossible to achieve this without your help as a donor. Worldwide there are 285 million people with a visual impairments. Eighty percent of these visual handicaps are avoidable or curable. But not everyone has access to good eye care. 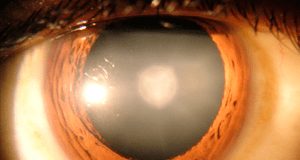 Cataract is the leading cause of blindness in the world, followed by refractive errors. In addition, there are many other eye conditions that can affect people`s vision. Thanks to the support of donors, the Eye Care Foundation is able to help many people. The unique, personal stories of eye patients show you that your donation can change their lives.